« Did Barbie leave a lasting impression on you? When I was younger, I thought happiness meant a life filled with great accomplishment and equally exciting adventures. From age 21 to 37 I was a broadcast journalist and my life often matched my expectations. And when it didn’t match, there was always the possibility that my very next news series or documentary would deliver even more; more excitement, more travel, more awards, more attention. I had chosen a high pressure career that I though would deliver a lot…and I was driven! And I delivered! I won numerous awards; Emmy’s, a Peabody, a mid career journalism fellowship to Stanford University. My series on Binge Eating Disorder, when the eating disorder was first officially named as separate from Bulimia, won a Clarion Award from Women in Communications. Following appearances on the Oprah Winfrey Show, I found myself opening a Binge Eating Disorder Treatment Center. I was driven, stressed, and now I know I used excitement for purposes of distraction. I was actually very unhappy during that time… through most of those years I had a raging binge eating disorder. The excitement was a way to distract from thoughts and feelings I didn’t want to feel. A need for distraction also fueled my nightly trips up and down the aisles of the local convenience store, on the way home from work. I was looking for the perfect foods to help me disconnect from the stress and from me. My body dissatisfaction thoughts, and my pursuit of the next “perfect” diet, also distracted me from all thoughts, feelings, or truths about my life that I did not wish to tolerate.”If I could just lose enough weight”, I was sure I could be happy. Turns out happiness had nothing to do with my weight. With my recovery work came mindfulness, new tools for emotional regulation, and emotional calm…and, interestingly enough, much less need for excitement. With this new emotional quiet came intuitive happiness. What I mean by that is I was now free to experiment, recognize (feel), and connect to pursuits that actually made me feel happy. I found I love doing mosaics. I thoroughly enjoy spending time with my best friends. I started writing again. Serving as the current Vice President of BEDA; the Binge Eating Disorder Association, feels rewarding on many levels. I find great satisfaction doing volunteer work for a Golden Retriever rescue group called GRRAND. I adopted my dog Emma through GRRAND and when asked if I’d be interested in doing some work for them, instead of my usual “no”, I said. “Hmmm, what do you have in mind?” I found I enjoy follow-up work. I call adoptive families, periodically, through the first year of adoption. We help catch and solve any behavior problems that might lead to a failed placement. These dogs have been through so much already! Many were abandoned by their first families and/or were strays who were just hours from being euthanized. 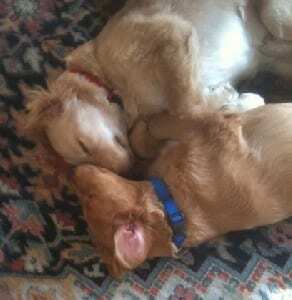 Look at these two content adopted pups and you may understand why I find this volunteer work so satisfying. Today, my happiness is quiet, and deeply nourishing. Have you found what makes you truly happy? Do you regularly engage in those activities?